This post was written by Hatchet reporter Darius Kamshad. The women’s soccer team has started the season 4-0 for the first time in program history, earning its fourth victory Sunday with a 1-0 win over Liberty. A clever chip from sophomore forward MacKenzie Cowley sailed over the Liberty keeper in the ninth minute of play, giving GW the early edge. The goal was Cowley’s first of the season and all that he Colonials would need to take the game. 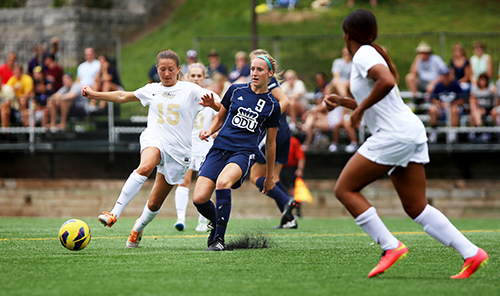 GW is now one of 21 Division I women’s soccer teams who remain unbeaten and untied this season. With the win, the Colonials add to their resume a defeat of last year’s Big South champions and NCAA tournament qualifiers. The Flames showed their strength, battering the Colonials backline and outshooting GW 17-9. A second half scare from Liberty senior midfielder Rebeccah Smith flew just barely wide of the net. Liberty also tested the Colonials defense with series of corner kicks, but never found the back of the net. The Colonials were more accurate with their limited chances, matching the Flames with five shots on goal, including Cowley’s successful effort. Sophomore midfielder Lina Proska threatened with an impressive shot on target only moments after Cowley’s goal, but the Liberty keeper saved it. GW goalkeeper redshirt freshman Miranda Horn maintained her spotless record, racking up five saves through 90 shut-out minutes between the woodwork. The Colonials are now the only team in the A-10 that has not conceded a goal so far this season. The Colonials will next face ETSU at 3 p.m. Friday, hosting the Buccaneers at the GW Soccer Field.